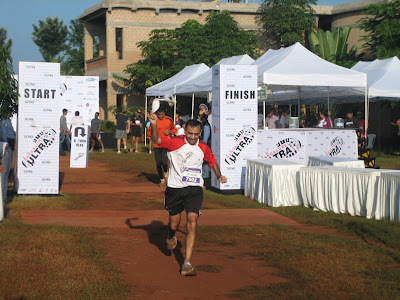 A quick post exactly one week after Bangalore Ultra 2010 to say that everything went as per plan on race day and I had an excellent run bettering my goal of 9:30 by a good margin. I finished my 75Km run quite strongly in 8:56:04 - a course record for the distance - this despite the weather being much warmer than it has been the past two years. With an easy paced 11Km run today the recovery has also been quite smooth. Lots of runners did amazing timings this year specially from BHUKMP. Click here for the list of winners and here for full results. Here are the top timings for some of the distances/categories.